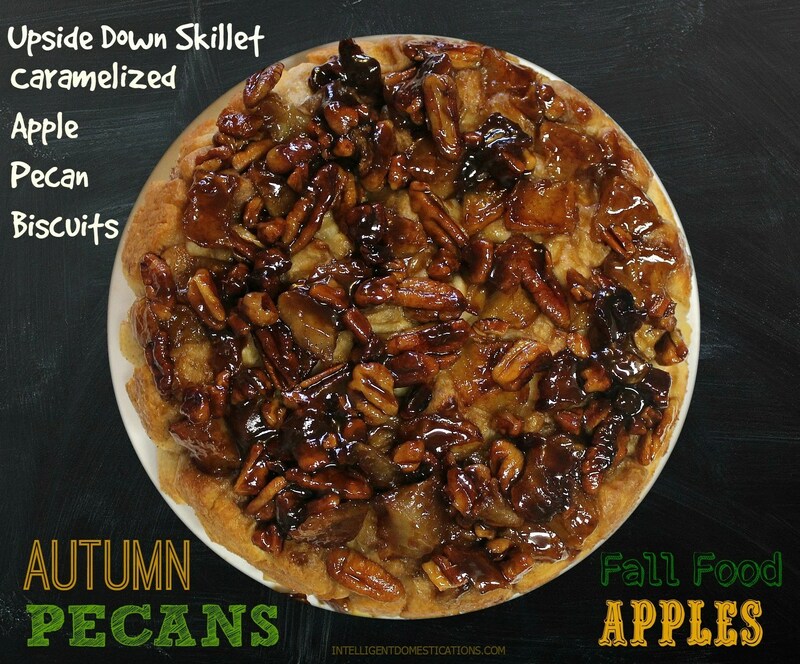 Fall recipes are everywhere! Pumpkins and Apples make everything better. Why do we wait until Fall to use those ingredients? I don’t know but I want to share one more with you! I sat down with a large stack of some of my favorite cookbooks in search of ‘something different’. It needed to be easy, tasty and use apples because I had three Honeycrisp sitting on the kitchen counter. 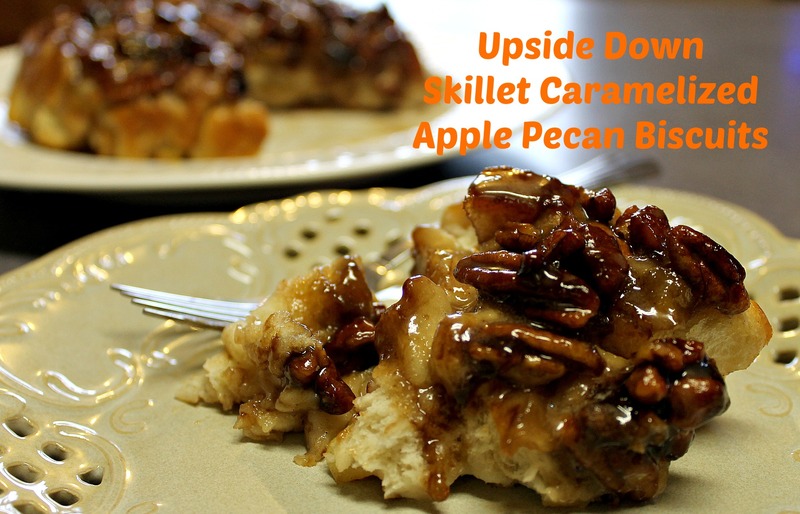 I did not find the perfect recipe but I did come across one which inspired me to create this Upside Down Skillet Caramelized Apple Pecan Biscuits recipe. The printable recipe is below but first let me show you the steps in luscious pictures. Yes, it is a long name but seriously I couldn’t think of a single word to leave out! 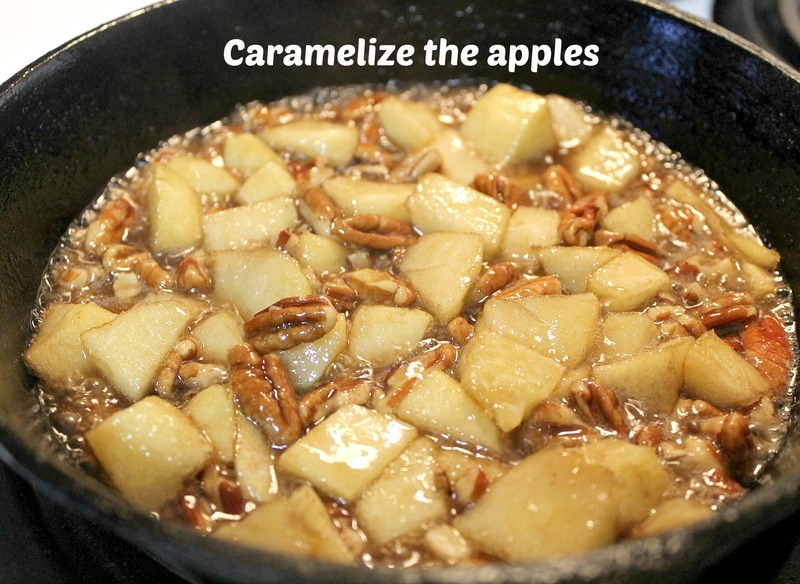 I made it in my little iron skillet, the apples are caramelized and well, you see those luscious pecans! The bottom will become the top so that baby is upside down! 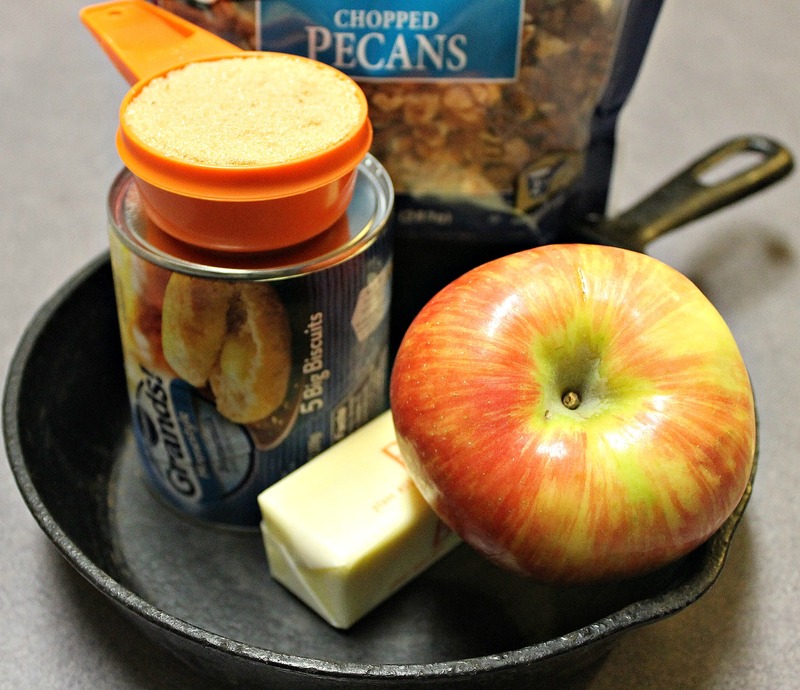 All you need is an iron skillet, butter, an apple, brown sugar, pecans and biscuits. 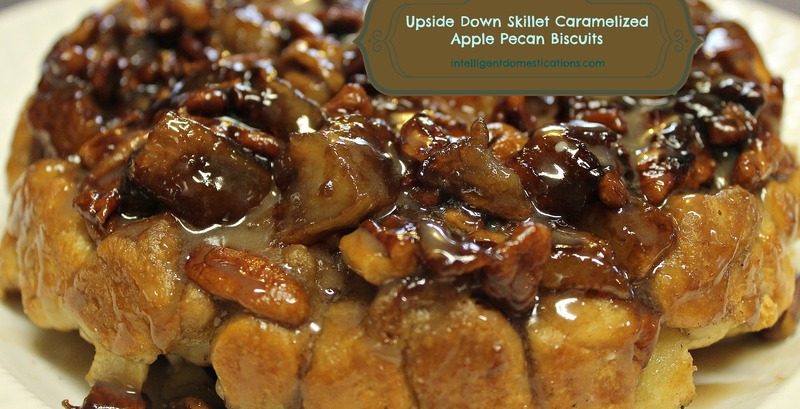 Gracious goodness, those apples sure do look delicious caramelizing with the pecans! Now place the biscuit pieces on top of the caramelized mixture. Then place the remaining cut up apples on top of the biscuit pieces. Sprinkle with Cinnamon Sugar if desired. Fresh from the oven! The top is about to become the bottom. No need to wait on it to cool. 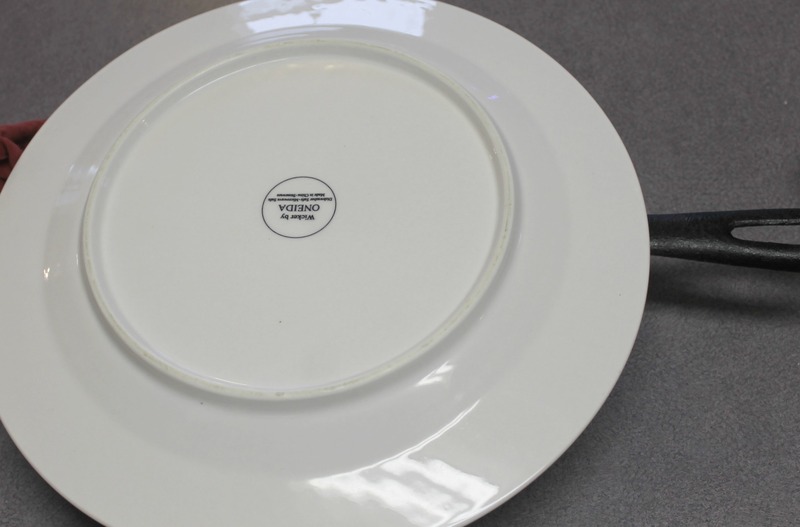 Place a plate on top of the iron skillet as shown. The iron skillet will still be very hot so use caution and pot holders! Flip the plate and skillet over together. Just the right amount of caramel dripping through the biscuits! My hubs loved it so much he has plans for me to make it again this weekend. That makes me smile. 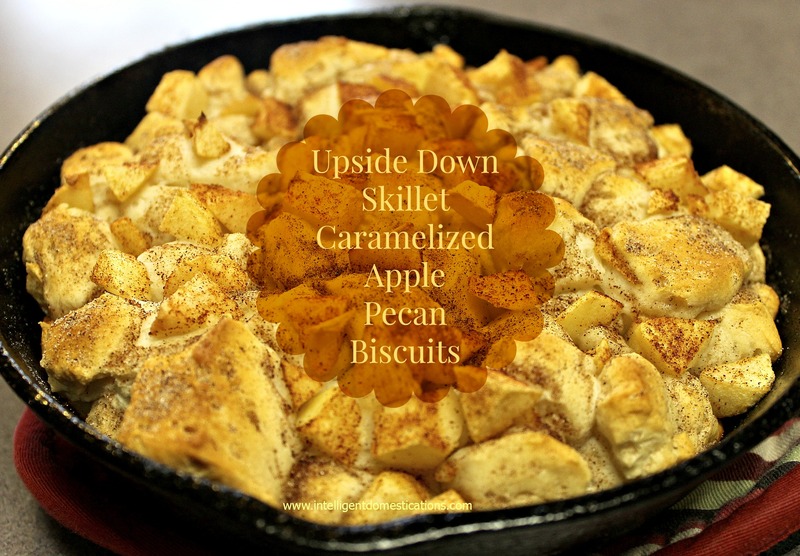 An easy Iron Skillet recipe for a breakfast favorite, sweet rolls with a perky twist. Melt the butter in a small iron skillet at medium high heat. Add in the brown sugar and stir until dissolved. 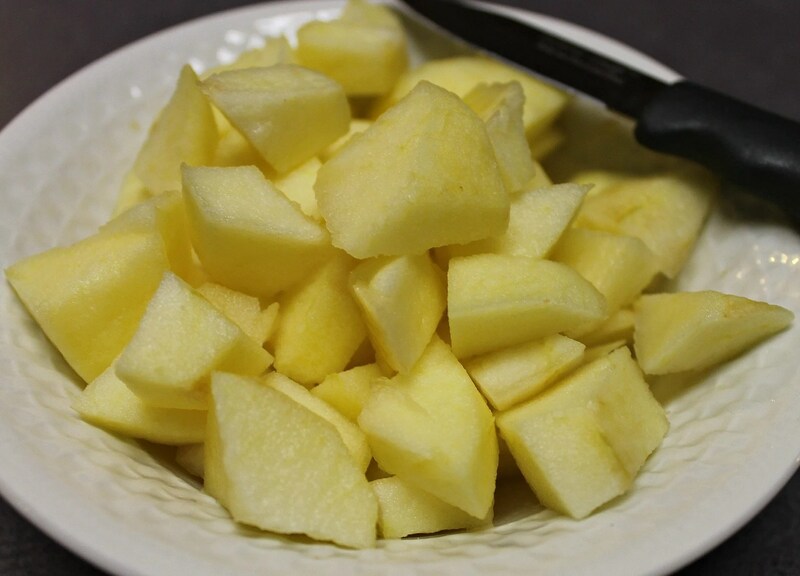 Then add all but about ¼ cup of the chopped apples. 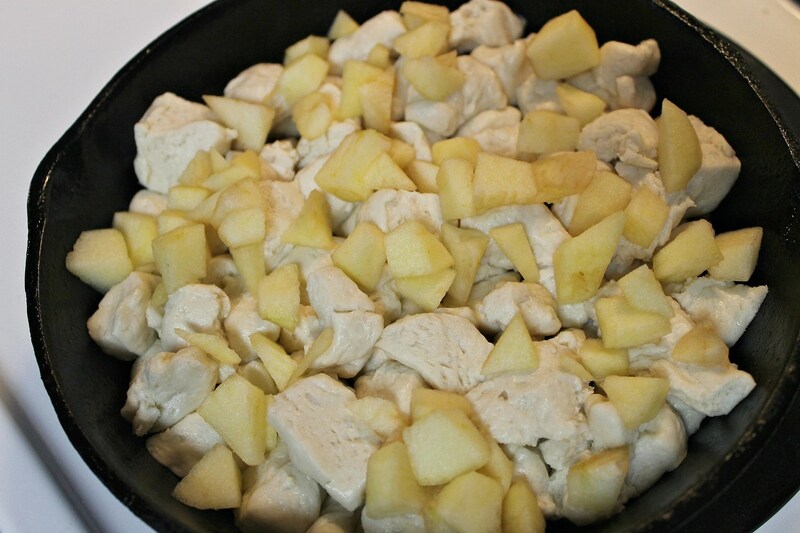 Stir often and cook until the apples are soft and caramelized which will take about 10-15 minutes. Remove from oven. Place your serving plate on top of the iron skillet covering the bread. Carefully, using pot holders as the skillet is very hot, flip the skillet over with the plate. Now the caramelized bottom is the top! You can follow our Fall Frolics, Food and Fun Board on Pinterest for lots more Fall ideas! These looks delicious! I have featured them this week at #FoodieFridays. Please stop by and party with us again this week. Caramelized apples are the best! Thanks for sharing your fabulous recipe with us this week at Foodie Fridays. Hope to see you again this week. I’m sure you’ll be cooking up something delicious! Oh my, Shirley! I am so hoping I have all the ingredients to make this or else I’ll have to go to the grocery. Looks so good with all the perfect ingredients!!! Wow! Good thing I don’t have this made right now. I’d eat the whole thing and no one would be the wiser. LOL!! Would love it if you’d stop by Wonderful Wednesday Blog Hop on Ducks ‘n a Row sometime to share this. Love it! I’ve made cinnamon rolls this way, but this recipe takes it over the top. Honey crisp are my fave apples. I recently made apple butter with them for my fall hostess gift post. Oh yes, we love those Honeycrisp apples. I like to buy the really big ones at the Fresh Market! Yum!